Campus Day is this Sunday, March 24th Future Gryphons, so we’re breaking down why you should be here! Meet current students, and faculty, as well staff from various student service areas including Admission Services, Housing Services, Athletics, Hospitality Services, Student Accessibility Services, Student Experience and many more! Each program will host a half hour session covering the basics on course requirements and exciting academic opportunities. Visit the Campus Day webpage to plan your visit using our session schedule. Most of our academic buildings will be offering guided or drop-in tours throughout the day. There will also be presentations and demonstrations, so if there is something specific you want to see, check out our online schedule and make note! U of G food has been ranked #1 on any Canadian university campus for over 10 years. Pick up a Campus Day program as soon as you arrive to see what’s open this Sunday! Arrive at the marked entrances to our residence buildings and a tour guide will greet you and show you around. This is a great way to picture yourself in your future home before applying to residence. The University Bookstore is offering 25% off all regular priced clothing for Campus Day. We want all Future Gryphons to represent U of G! We’ll be covering the day on social (Snapchat, Instagram and Twitter); follow “uofgadmission,” send us your snaps and share your pics on Instagram using the hashtag #futuregryphon. Visit our Campus Day event page to register now and plan your day. Back in October we let you in on why you should study computing at U of G. If you missed that article you can still view it on our website. Now we’re back to tell you all about the experiential learning (EL) opportunities that you can take part in as a Bachelor of Computing student at the University of Guelph. The area of application is a unique component of our computing degree that allows you to study a secondary subject and learn to apply computing principles to that field of study. For example, you could choose to study Biology as your area of application and explore the bioinformatics field. Or you could select Business Administration and work on developing business apps and analyze business systems. There are over 40 different areas of application so you can truly choose anything that interests you! In upper years you can take courses with experiential learning built right into them! From System Analysis and Design in Applications, to our new Data Science course, you’ll have plenty of opportunities to display your learning and skill development in various design, engineering and programming courses. Both of our computing majors are available in a co-op stream. Not only are co-op placements good for networking, skill development and gaining hands-on experience, they are a great way to try out different work environments and industries to get a feel for where you’d like to work in the future! Historically, BComp students have completed co-ops with companies such as Amazon, Microsoft, Apple, Google and more! Visit the Recruit Guelph website for more information on co-operative education at Guelph. In addition to the for-credit EL examples listed above, there are a TON of extracurricular activities that will broaden your horizons in computing. Several student organizations exist to support and provide resources to computing students including the Guelph Women in Computer Science organization, the Society of Computing and Information Science and the Guelph Coding Community. As a computing student you will also be invited to participate in different community building events such as the Roboticon robotics challenge, Hackathons and more! Information on all these opportunities and more are available on the School of Computer Science website along with testimonials from students in the program! As always, you can also find more information on EL at U of G on the Experiential Learning website. Our second round of offers has officially started and will continue until mid-April. The second round is when we send out alternate offers. What is an alternate offer? I got an alternate offer. What does that mean for me? I got an alternate offer. Now what? If you haven't yet received an offer, COMPLETE a Student Profile Form by May 1, 2019! Check your OUAC account for an admission offer from U of G! Offers will show up there first, and then you can expect a congratulations package from us in the mail! Visit our Admission Plan webpage to find out how we send out offers. Experiential Learning (EL) is all about learning through action and reflection both inside and outside the classroom. Today we’re sharing the EL opportunities available to our Bachelor of Commerce (BComm or business) students here at U of G.
Courses that intentionally include activities like structured projects, lab work, design work, case studies or entrepreneurship can be considered course-integrated experiential learning. They allow you to apply your skills and display your academic learning to help prepare you for your future. Most course-integrated EL courses in our commerce program are offered in third and fourth year and include Applied Business Project I & II, Theory of Strategic Management, Beverage Management, Introduction to Econometrics, Food Product Development I & II, Business Consulting, Property Management and many more! Check out the Experiential Learning Guide for a complete list. Our Certificate in Leadership is one of two for-credit experiential learning certificates and focuses on new leadership models and practical applications for leadership skills in an organizational setting. Our Certificate in Civic Engagement and Global Citizenship is the second for-credit EL certificate and aims to explore how the diversity of people in the world contribute to problems and solutions. U of G offers several additional certificates for students who want to develop or upgrade skills in a specific area. They make a great addition to any degree program! Check out the Undergraduate Calendar for a complete list of available certificates. Co-op is offered for all 8 of our BComm majors! That means that no matter what major interests you, you can gain work experience, learn transferrable skills and build your professional network in the co-op stream. Visit recruitguelph.ca to learn more about co-op at U of G.
Professional practice curses or programs will allow you to work under the guidance of a professional to gain relevant experience and skills. These opportunities include internships, externships and practicums. The School of Hospitality, Food and Tourism Management offers courses in Restaurant Operations that allow you to gain foodservice management experience while placing a strong emphasis on teamwork. Visit our website for course descriptions and more details. This is the hub for student entrepreneurship on campus. The John F. Wood Centre offers several resources to enable our business students to become business leaders. For example, the Hub Incubator Program offers BComm students the opportunity to receive support to grow a potential startup. Students can take a Business Consulting Course to get out of the classroom and work with real organizations in the community. The MakerSpace is available for student collaboration and exploration. For a complete list of resources offered by the John F Wood Centre, as well as additional details, visit their website. When it comes to learning through experience, there are absolutely TONS of options. We recommend checking out the Experiential Learning website to explore other potential opportunities and to read testimonials from current students on how EL has positively contributed to their university experience. Tomorrow is International Women’s Day; a global day that celebrates the many achievements of women. At U of G there are several events taking place across campus meant to acknowledge and empower women. What better way is there to kick-off International Women’s Day than with a celebratory breakfast? All U of G faculty and staff have been invited to our Summerlee Science Complex to enjoy a community breakfast and hear our provost Charlotte Yates speak about gender equality on campus. This is a full day conference where attendees will learn about the research U of G is currently doing on women through the Research Facility for Women’s Health and Well-Being. The event includes a keynote address, musical and spoken-word performances and research presentations by students. Our Wellness Education and Promotion Centre has organized a 5K run on campus meant to support and empower women. Anybody is welcome to participate and take this run/walk at their own pace. All U of G students are invited to attend this dinner in honour of International Women’s Day. Attendees will enjoy a three-course meal and have the opportunity to hear 3 inspirational keynote speeches and network with industry representatives from over 15 organizations! In addition to the events happening around campus throughout the day, the U of G community is welcome to drop by the UC from 9:00 am to 5:00 pm for International Women’s Day celebratory activities. There will be a display highlighting the achievements of inspirational women, a selfie station where you can snap a picture to show your support on social media, and a noon hour concert featuring Janette King! No matter how or where you are celebrating International Women’s Day, be sure to share your pictures on social media using the hashtags #IWD2019 and #BalanceforBetter to acknowledge and empower women everywhere. Last week we talked about experiential learning opportunities available to Bachelor of Arts students. If you missed that article you can still view it on our website. Today we’re breaking down experiential learning (EL) in the Sciences. Buckle up Future Gryphons! In these courses you will investigate a topic in your field of study in an academic, industry or community setting, while being supported by a faculty or staff supervisor. You will typically complete these courses and projects in either third or fourth year. Interested in applied animal research? Look into Experiments in Animal Biology! Is human health more your thing? Check out Research in Human Health and Nutritional Sciences. BSc students have historically completed independent study courses, advanced independent research, critical analysis courses, honours thesis projects and more as part of applied research in the sciences. Certificate and diploma programs can be completed part-time and are a great way to upgrade your skills in a key area. Visit our website to learn more about the certificate programs offered at U of G.
New in 2019/2020, students in biological sciences can complete an Internship (paid or volunteer) in Biological Science and work in consultation with an external organization. This course will allow you to apply scientific methodologies, gain project management experience and develop a project that benefits the community. Visit our website for more information about this course. Did you know that 11 of our Bachelor of Science majors have a co-op option? Co-op streams give you relevant work experience and help you develop transferrable skills that will help you succeed in the workplace – all while getting paid. You can complete your placements anywhere in Canada or internationally! Be sure to visit recruitguelph.ca for all the details! These courses have integrated experiential learning in the form of lab work, design work, simulations, performances and case studies allowing you to develop your skills and display what you’ve learned. As a science student you will benefit from course integrated learning throughout your degree, beginning as early as first year General Chemistry courses, through to upper year courses and projects such as Experiments in Animal Biology, Analytical Biochemistry, Thermodynamics and Kinetics, Human Anatomy, Plant Diversity and Evolution and many more! Several majors offer field courses which can take place in a partial or full semester. These courses are led by faculty and prepare you for professional work. In a typical field course, you will engage in first-hand investigation and analysis directly in a field location. Examples of field courses in the sciences include Crop Science Field Trips, Field Ecology, Marine Biology and Oceanography, Arctic Ecology and more. These courses allow you to work under the guidance of a professional to develop skills related to your field of study. These opportunities include internships, externships and practicums. For a complete list of professional practice courses available across various disciplines, check out our Experiential Learning webpages. Future Gryphons, these are just a fraction of the experiential learning opportunities available to U of G students! We recommend checking out the Experiential Learning website to explore other potential opportunities and to read testimonials from current students on how EL has positively contributed to their university experience. Today brings several important deadlines that you need to be aware of. Domestic (Canadian) high school students: Today is the official deadline to submit an undergraduate application to the University of Guelph via the Ontario Universities’ Application Centre (OUAC). If you have already applied, please note that you have until April 15th to make changes to your application. International applicants: Today is the last day to apply and submit your academic documents. Note: This includes your English Proficiency documents! Bachelor of Landscape Architecture applicants: Today is the deadline for you to submit your Background Information Form. Once filled out, please email the completed form to bla-bif@uoguelph.ca. Visit campus on a March Break Tour OR for Campus Day! Alright Future Gryphons, make note of those reminders, put in the work to get your application completed and go forth and enjoy the first weekend of March! Visit U of G on your March Break! March Break is just around the corner so today we’re inviting all #FutureGryphons to come visit U of G on a March Break Tour and explore our beautiful campus! Here are some of the highlights you can expect on your tour. We firmly believe that visiting a university campus is the best way to figure out if that school is a good fit for you. Many of our Gryphons say that after their campus visit, they knew that the U of G was the perfect fit for them. Our tours are your chance to step into a Gryphon’s shoes for a day, so come take it all in and use this experience to make the best decision for your future. It’s here. It’s live. It’s ready for you to sweat in it… okay maybe save the sweat for September, but the Athletic Centre is yours to explore on our March Break Tours. Don’t be afraid to ask questions on the tour to learn more about membership prices, what’s covered in your tuition, fitness classes and more. March Break is a busy tour time so for your benefit, we’ve brought on extra tour guides. This means smaller tour groups and more interaction. You’ll have more one-on-one time with your guide, and have lots of time to get your questions answered. Pro tip: Ask your tour guide their favourite study spot, or their favourite place to eat on campus. On top of showing you around, our tour guides are here to share their experiences, so make the most of your time with them and ask those hard-hitting questions! It’s awesome that March Break gives you the opportunity to tour campus during the week. You get to see U of G’s students in their natural habitat: attending class, studying in the library, running to hand in an assignment, enjoying coffee with friends and living the “typical” student life. Tip: We recommend sticking around for a bite to eat after the tour so you can sit back, take it all in, and try and picture yourself as a Gryphon. Creelman Hall and The Bull Ring are some of our most popular lunch locations and have countless meal options to satisfy any cravings or dietary restrictions. McLaughlin Library is at the centre of campus and offers a ton of academic supports as well as several different study and work environments. Students tend to spend a lot of time there so consider it another key area to try and picture yourself in! On your tour you’ll get the chance to visit a couple of student residences and picture yourself in your potential future home. For a more in-depth look at residence be sure to check out Student Housing Services’ virtual tours on YouTube! Come meet the people that make U of G a welcoming campus community, try the best campus food Canadian universities can offer, visit the residences you just might call home in the fall, check out our state-of-the-art facilities and lecture halls and witness what U of G means to its students – we know you won’t be let down. 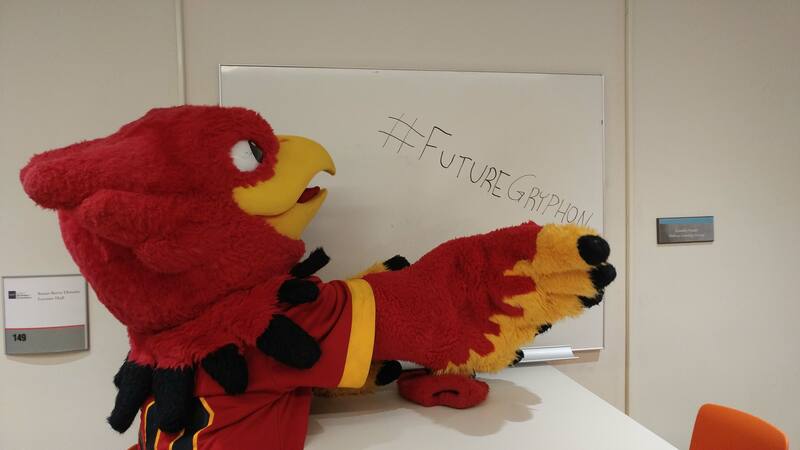 What are you waiting for Future Gryphons? If you are hoping to Find Yourself at Guelph in the fall, register for a March Break Tour today! In November, we broke down our Bachelor of Arts program for you. If you haven’t read that article, we recommend checking it out for key facts. Recently we outlined how experiential learning works at U of G. You can find that overview on our website. Today we’re providing examples of curricular and course-based experiential learning opportunities available to BA (Bachelor of Arts) students here at U of G. Keep in mind that these are just a small sample of everything that is available to you as a Guelph student. In these courses you will investigate topics in your field of study with the support of a faculty or staff supervisor. This research could take place in an academic, industry or community setting. In the past, BA students have completed research projects, written papers in language courses, explored topics in digital music, completed independent study courses in geography and even examined human rights from various contexts. We offer two for-credit certificates that will complement any degree program AND look great on a resumé. Within these certificate programs you will complete 2.50 credits of coursework as well as 120 hours of community engagement or leadership practice. Our Certificate in Leadership will teach you to apply various leadership models in a variety of organizational settings. Our Certificate in Civic Engagement and Global Citizenship explores how diversity in our world contributes to both problems and solutions. These courses ask students to work with a community organization and use their education and acquired skills to implement activities that benefit both the student and the community. These experiences can happen in Guelph, Canada or internationally. Our BA students have participated in political science seminars, taken workplace learning courses in history, completed upper year language courses, studied topics in ethnomusicology and more, all under the curricular community engaged learning umbrella. Co-op opportunities currently exist for several BA majors including Economics, Mathematical Economics, Political Science and Psychology. Completing the co-op stream of a program gives you relevant work experience, allows you to build your professional network and develop transferrable skills that will help you succeed in the workplace – all while getting paid. You can complete your placements anywhere in Canada or internationally! These courses include structured projects, lab work, design work, simulations, performances and case studies so that you can build and develop your skills and display what you’ve learned. Examples of courses with integrated experiential learning include Applied Human Geography, Applied Geomatics, International Relations of Middle East, The Uses of History and Introduction to performance courses. Several majors offer field courses which can take place in a partial or full semester. These courses are led by faculty and prepare you for professional work. In a typical field course you will engage in first-hand investigation and analysis directly in a field location. Examples of these courses include Field Research, Social Studies and Topics in Political Science. We recommend getting in touch with your program counsellor to find out what field courses are available within your program. Professional Practice Courses are typically available in upper years however in some majors such as Music, you can begin as early as your first year! Again, these examples are just a fraction of experiential learning opportunities available to Guelph students. Over the next few weeks we’ll be highlighting additional examples available to students in our other degree programs. In the meantime we highly recommend that you review our Experiential Learning Catalogue and make note of what you think would contribute positively to your university experience! The Background Information Form (BIF) is vital for your application to our Landscape Architecture Program. This is where you tell us about yourself, describe your interest in the program and provide other details that help the BLA Admissions Committee make admission decisions. The deadline for high school students to submit the Background Information Form is March 1st, 2019 (That’s next Friday friends)! Once you complete the form, you must submit it as an attachment to bla-bif@uoguelph.ca, with the subject line: lastname_firstname_BLABIF. Offers to the BLA program will be made in early May for currently enrolled high school students.